I decided to get a leather seat cover for my 2004 Ford Escape XLS from Lederland Enterprise at West Ave, almost across Hap Chan Tea House at Examiner cor West Ave. It's not really a genuine leather but german leather/leatherette as they call it. 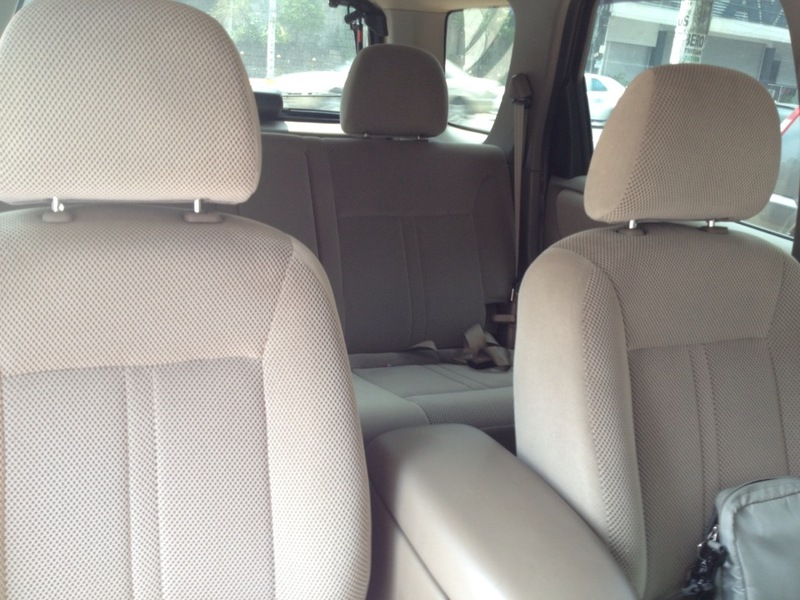 The same material that other seat cover companies offer like MG Square and Seatmate. 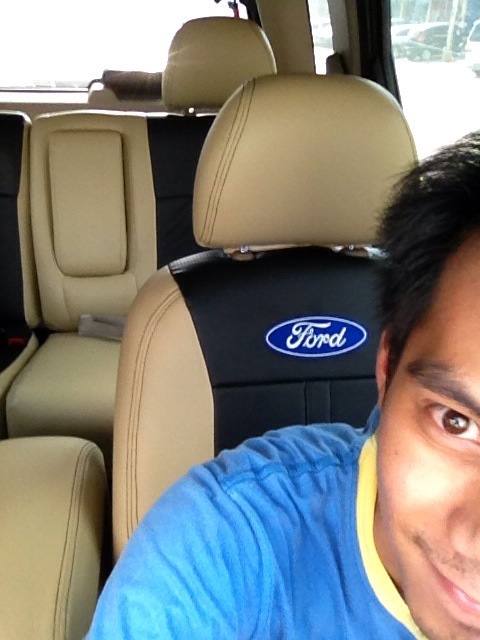 I got mine in black (perforated) and beige design with embroidered Ford branding on the driver and passenger seats. I spent P6,500 for it including the P500 embroidery fee. It was originally priced at 6,500 negotiated a discount of 500 and use that again for embroidered logo. Ordered the leather seat cover Thursday, Lederland said it should be available by Monday but may spill till Tue because of the embroidery. Came Tue, then Wed then Thurs when the seat cover is finally ready for installation but I dont have time during weekends so I have it done on Sat. Came at the lederland at 10:30am , was able to leave that place at 3:30pm. WTF right?! Why ? They manage to cover it up by using vinyl paint but it took me couple of waiting hours. Bwiset! My car has fold-able panels at the back of the front seats, and guess what they installed the covers with garters over the panels, claiming it was the design. I said how will I'll be able to use the panels if garters are blocking it?! All they say was it was the design. Told them to remove the panels first before installing the covers but they're stubborn. I yell telling them what to do and they listen. atlast. They bring back the panels but not totally fit on the back seat holes, and the covers and properly inserted in between the panel and old upholstery. Again they insist that it will be impossible as the pattern is design that way. I made passenger side, the way I'm telling them to do it and it was done, perfectly. I ask them what were you saying again earlier? That's when they listen again. Some of the stitches on the head rest and back seats are not aligned with the original design. It looks awful if you look at it carefully. I don't even understand why the installer removed the arm rest on my back seat when the design of the seat cover would not require to. They end up damaging the fabric of my arm rest and messing up with the plastic bushing. And what's more classic, during the time I was about to give the deposit, an angry man came with his wooden steering wheel with a large, deep and long scratch or dent. I think its for a lexus car. And they just requested for a leather wrap. Silly me, i took the risk and i lost. If I only know this is going to happen, might as well went to seatmate or MG Square. - I went home hungry and feeling weak. I wasnt able to eat. They didn't even offer me some food nor just plain water? So much for customer service. Mukha silang pera. Tsk tsk. Sorry wont bring back nor even equate to the hassle i've experience dealing with them. By the way that ford logo on your seat covers is kinada awkwardly baduy. 8) Sorry man I just have to. This was done last year i think may of 2013.
uh oh... Better be on the guard. Don't want to see them messing with a brand new car!! I'll bring my special tool for removing clip in case they use their macgyver screw driver on everything again. As for the logo yeah No offense man, just can't help it. ehehe. I don't know, I think that's why car companies don't put logo on their seats unless it is a performance brand or like Recaro, Nismo something. ;) Well to each their own. Argg i did too many typo errors on my previous comment. Anyway , yeah, i hope they did learn their lesson.